Many people are familiar with the “product backlog”, a prioritized list of user stories that is one of the artifacts of the Scrum framework. While the product backlog can be very useful for letting developers know what to work on next, its one-dimensional nature tends to limit the amount of information it radiates. In other words, the product backlog tells developers what to work on, but not necessarily why. Story Mapping is a technique designed to help the Product Owner prioritize user stories into sensible releases that maximize value by placing emphasis on the users of the software and what they can accomplish when the software is released. It is a concept first put forward by Jeff Patton on his blog, Agile Product Design. 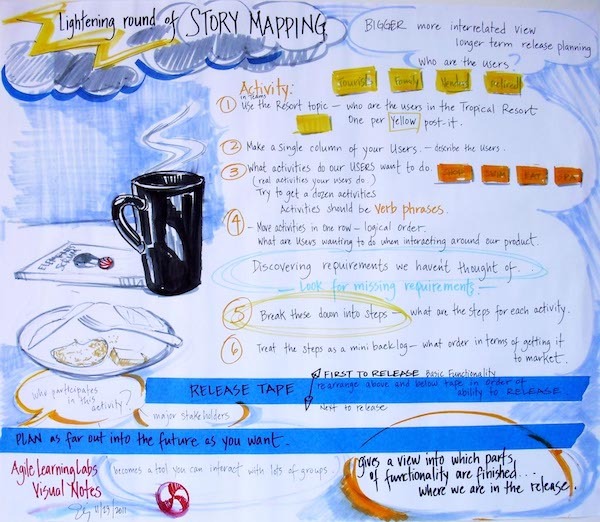 Chris Sims wrote more about Story Mapping on InfoQ. The result of the Story Mapping exercise is a two-dimensional representation of the users, their activities, and the user stories needed to implement the functionality they want, all in a big, visible “chart” that contains much more meaningful information than a simple backlog. The technique demonstrated is powerful, yet simple enough that participants in the exercise will be able to apply it immediately.